"mTOR" or mammalian target of rapamycin refers to an enzyme from the serine/threonine protein kinase family encoded by the mTOR gene. It is found in humans as well as worms, mice, flies and yeasts. It regulates the growth, proliferation, motility and survival of cells. ¤ Cell senescence seems to be the driving force behind ageing, both in terms of loss of cell-replication potential as well as mTOR signalling pathways inducing “too much growth”. Successfully inhibiting mTOR signalling pathways has been shown to produce increased lifespan in worms, flies, yeasts and even mice if accompanied by calorie restriction. ¤ Rapamycin is a molecule produced naturally by the mycelial bacterium Streptomyces hygroscopicus, which was discovered on Easter Island in 1975. Also known as Sirolimus, it is an immunosuppressant drug used in orthodox medicine to prevent rejection following organ transplantation. Rapamycin inhibits the mTOR signalling pathway and studies show it can significantly extend lifespan in mammals, even when taken in later life, with increases in life expectancy for males and females of between 9% and 14% respectively. ¤ Other studies have identified its anti-diabetic properties (types I and II), as well as benefits for age-related cognitive decline, with increases in memory and learning capacity, and in particular, decreases in certain proteins seen in neurodegenerative diseases such as Alzheimer’s. ¤ In pre-clinical trials, Rapamycin analogues or “Rapalogs”, in particular inhibitors of the complex mTORC1, have shown measurable efficacy against certain cancers. ¤ Recent scientific findings suggest that, at precise concentrations, a number of completely natural substances can also inhibit mTOR; Natural Rapalogs contains a combination of these substances. ¤ Meriva® is a patented curcumin formulation (derived from Curcuma longa) combined with soy phospholipids to increase its bioavailability beyond that of classic standardised curcumin extracts. This key curcuma ingredient has emerged as a natural mTOR inhibitor and exhibits anti-tumour properties in a variety of cancer cell lines via modification of a number of oncogenic pathways. ¤ Studies have confirmed the inhibitory role of certain components of green tea (Camellia sinensis) on mTORC1 and mTORC2. Specifically, a study conducted by GlaxoSmithKline in Collegeville, Pennsylvania, showed that EGCg (epigallocatechin-3-gallate) acted as a double inhibitor, both of the P13K (phosphoinositide-3-kinase) pathway and the mTOR signalling pathway. ¤ Research has established that transresveratrol, a polyphenol compound and calorie restriction mimetic, also inhibits the mTOR signalling pathway. Studies show that this pathway is activated by oxidised LDL-cholesterol lipoproteins in smooth muscle cells. Resveratrol can, however, block the phosphorylation and activation of the P13K and mTOR pathways. This activity is independent of resveratrol’s antioxidant effect and its activation of AMPK and clearly identifies a new property for resveratrol that may add to this polyphenol’s overall anti-atherogenic capacities. Another article reported that at relatively high doses, resveratrol inhibits mTOR and cell senescence, while contributing to cell apoptosis. ¤ This flavonoid, extracted from the small tree Rhus succedanea, sends an activating signal to anti-aging gene carrier cells, ensuring DNA and neuron protection, particularly during periods of oxidative stress. ¤ Fisetin also has a stabilising effect on resveratrol by preventing its metabolic breakdown and thus supports its function of inhibiting the mTOR signalling pathway. Fisetin has also been shown to exhibit anti-tumour and anti-angiogenic activity. ¤ This highly active compound, extracted from white willow bark (Salix alba) gave rise to the isolation of the acetylsalicylic acid molecule (aspirin®) by the chemist Felix Hoffman. It has been shown that taking a baby aspirin (81 mg) a day cuts the risk of developing cancer by at least 25%. Salicin possesses all the activity of aspirin® including its mTOR inhibitory effect. Although not as fast-acting as aspirin®, its effect is less irritating and it has longer-lasting efficacy. 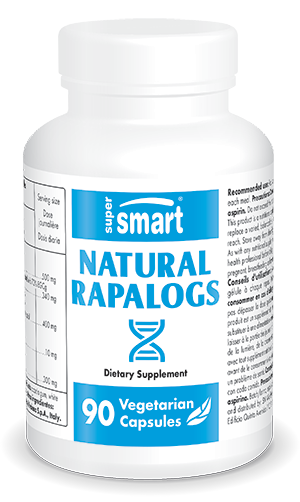 With its exceptional formulation, the complex Natural Rapalogs offers the benefits of five natural inhibitors of the mTOR signalling pathway. In addition to this potent natural complex, other natural anti-ageing supplements may also be of interest. The product Longevity Nutrients, for example, has been formulated to provide a range of anti-ageing nutrients with antioxidant, anti-inflammatory and anti-infection effects. Similarly, the powerful AMPK Booster contains three plant extracts with active principles that reactivate a key enzyme of metabolism called AMPK. Discover too the supplement Nicotinamide Mononucleotide (NMN), an innovative formulation based on the latest advances in anti-ageing medicine.